Rep. Steve King (R-Iowa) isn’t lacking in thoughts that unhinge people. 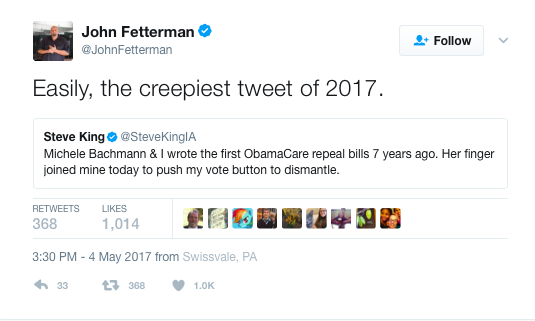 A tweet this week, however, about his finger to finger touching ex-Rep. Michele Bachmann (R-Minn.) has political observers calling him creepy. I mean, this does sound a little gross. Right? Let’s just hope their respective fingers were clean. John Fetterman isn’t a random follower. He’s the mayor of Braddock, Pa. The Mirror attempted to call King’s Washington office to pester his press secretary about the tweet and whether King handles his own Twitter account. But the main phone line went directly to voicemail at 3 p.m. I followed up by emailing Casaday Nguyen, his policy director. Friday is the press secretary’s last day, so I was directed to send my email request to a different email. I pushed more for the meaning behind his touchy tweet. There are other examples of King’s bizarre comments over the years.